What is eSoftTools NSF to PST Converter? 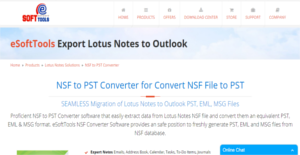 eSoftTools NSF to PST Converter is a powerful NSF to PST conversion software that effortlessly extracts information from Lotus Notes NSF files and transforms them into PST format. Aside from PST, the software is also capable of converting NSF files into EML and MSG formats. With eSoftTools NST to PSFT Converter Software, users are able to export NST files including all the data within, such as address emails, calendars, books, tasks, to-do lists, journals, and other items. It is also capable of exporting Notes emails to PST, EML, EMLX, HTML, CSV, and MSG files. eSoftTools NSF to PST Converter also ensures that data structure remains intact and unchanged during and after the conversion and migration process. eSoftTools NSF to PST Converter is an ideal tool whenever you are unable to open your NSF files and require a quick and easy solution to recover or retrieve all the data within your Lotus Notes files and convert them into PST completely. And if you prefer, you can have your files converted to EML and MSG as well. Whatever data you need to be recovered and converted, eSoftTools NSF to PST Converter gets the job done. You can restore files and their attachments, including emails, messages, contacts, journals, calendars, tasks, drafts, and more. Prior to initiating the conversion process, you can preview your Lotus Notes items and see if they are the files you want to be converted and exported to PST. By giving you a preview, you can be sure if you are converting the right files and make the necessary adjustment before starting the conversion. When you convert your NSF files to PST format, the software does so without changing the structure of your files and folders. Your new PST files have the same structure. No lacking information. No data loss. No confusion. Whether you are looking to convert the entire mailbox or just a few files and folders, eSoftTools lets you do just that. No need for you to include files that you don’t need. Or if you want to convert the entire structure, you can with just a click of the button. What Problems Will eSoftTools NSF to PST Converter Solve? There are instances when admins want to change the emails platform. Both Lotus Notes and MS Outlook are widely used emails clients application which is why there is a need to convert from Lotus Notes to MS Outlook and vice versa. eSoftTools NSF to PST Converter Software makes the whole conversion process fast, simple, and secure. Users can convert entire mailboxes of Lotus Notes NSF file into PST Outlook file without any difficulty. This converter platform also enables users to perform selective conversions, transform only specific folders or items from NSF file to PST that you can directly open in MS Outlook application. It is essential to keep in mind that virtually no app in the Collaboration Software category will be an ideal solution that can match all the requirements of different company types, sizes and industries. It may be a good idea to read a few eSoftTools NSF to PST Converter reviews first as specific software may excel exclusively in a really small group of applications or be designed with a very specific industry in mind. Others may function with a goal of being easy and intuitive and consequently lack complicated features needed by more experienced users. You can also come across apps that cater to a wide group of customers and provide a complex feature toolbox, but this in most cases comes at a higher cost of such a service. Ensure you're aware of your requirements so that you get a service that provides all the elements you look for. How Much Does eSoftTools NSF to PST Converter Cost? We realize that when you make a decision to buy Document Management Software it’s important not only to see how experts evaluate it in their reviews, but also to find out if the real people and companies that buy it are actually satisfied with the product. That’s why we’ve created our behavior-based Customer Satisfaction Algorithm™ that gathers customer reviews, comments and eSoftTools NSF to PST Converter reviews across a wide range of social media sites. The data is then presented in an easy to digest form showing how many people had positive and negative experience with eSoftTools NSF to PST Converter. With that information at hand you should be equipped to make an informed buying decision that you won’t regret. What are eSoftTools NSF to PST Converter pricing details? What integrations are available for eSoftTools NSF to PST Converter? If you need more information about eSoftTools NSF to PST Converter or you simply have a question let us know what you need and we’ll forward your request directly to the vendor.